Part Two of our Corporate Foundation Impact series highlights the considerable success of the Avon Foundation! Their strong focus on two key women’s initiatives - the fight against breast cancer, and putting an end to domestic violence - has enabled them to make a major difference in the lives of women around the world. Our guest expert, Christine Jaworsky, Program Director for Speak out Against Domestic Violence, shares how the Avon Foundation is making a substantial difference. FrontStream (FS): What is the best way to establish longevity and relevance in your foundation? How do you get employees to engage? Christine: For over 60 years, the Avon Foundation for Women has been a driving force behind charitable, scientific, educational and humanitarian work that improves the lives of women and their families. Our efforts to eradicate breast cancer and end domestic and gender violence worldwide have helped move these issues out of the shadows and into the public dialogue. And as attitudes continue to change – from fear and isolation to knowledge, action and empowerment – so do the lives of countless women everywhere. Avon Associates are engaged with these issues at a very deep level. Avon is “the company for women,” and our Associates often express that one of the main reasons they chose to work with Avon is because Avon has such a long-standing commitment to these issues. It’s easy to engage Associates when they feel so strongly about Avon’s causes, and we make it easy for them to participate. 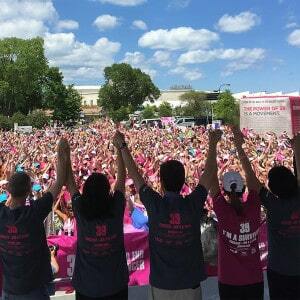 They can see an immediate impact of their efforts, for example at Avon 39 The Walk to End Breast Cancer, where grants are made to leading organizations at the end of each Walk weekend. 39 miles over two days isn’t easy; however, the reward of seeing firsthand how their collaborative raised funds immediately impact breast cancer research and access to care is simply priceless. FS: What is one of the biggest challenges you think Avon Foundation has faced? Christine: One of the biggest challenges is that there is so much need for support, not only here in the U.S. but also across the world. Avon Products Inc. operates in 70 markets worldwide, and while each country is unique when you consider the local customs and traditions, violence against women and breast cancer isn’t. The Avon Foundation for Women works hard to seek and fund the best organizations, and through our efforts we are able to convene the top agencies affecting real and sustainable change in their communities around the world. Because Avon is so laser-focused on our two identified causes, it helps other very worthwhile organizations and advocates understand that although we can’t support them directly, Avon is certainly doing its part to make a difference. FS: Any favorite success stories or keys to Avon Foundation’s impact you could share? Christine: One of Avon’s key successes is our public-private partnership launched in 2010 among the U.S. Department of State, Vital Voices Global Partnership, and Avon Foundation and Avon Products, Inc. We joined together to announce the Global Partnership to End Violence Against Women, and we are continuing the work today with new initiatives and funding to help prevent and end violence against women in key markets worldwide. Avon’s newest funded project of the Global Partnership is The Justice Institute on Gender-Based Violence, an innovative and interactive multidisciplinary training and technical assistance course that brings together national judges, court officers, public prosecutors, police officers, and representatives of government agencies and non-governmental organizations. The Avon Foundation for Women and Avon Products, Inc. have funded and launched Institutes in Brazil, India, Mexico, Nepal, Philippines and South Africa, and we announced new funding in March 2016 for additional Institutes in Argentina and Colombia, as well as returning Institutes in India and South Africa by the end of 2016. Each country collaboration has or will receive training tailored to the jurisdiction where it is provided, emphasizing the specific context and challenges that women leaders identify, and keeping the survivor at the center of all efforts made on her behalf in the pursuit of justice. Did you miss Part One of our series? Read how Cardinal Health Foundation strives to be a good corporate citizen through powerful partnerships and strategic community impact!